BUENOS AIRES, Argentina — Pro-market leader Mauricio Macri won Argentina’s presidential runoff vote on Sunday, according to exit polls, heralding an end to 12 years of leftist government. Exit polls broadcast by several television channels just after voting closed at 6 p.m. local time indicated that conservative Macri, 56, had beaten his left-wing rival Daniel Scioli, without giving a breakdown. If the result is confirmed, the former chairman of Boca Juniors football club will become the most economically liberal president since the 1990s at the helm of Latin America’s third-biggest economy. Official results were due in the coming hours, but cheering, dancing crowds of Macri’s supporters were already celebrating at his rally in a conference center on the outskirts of Buenos Aires. 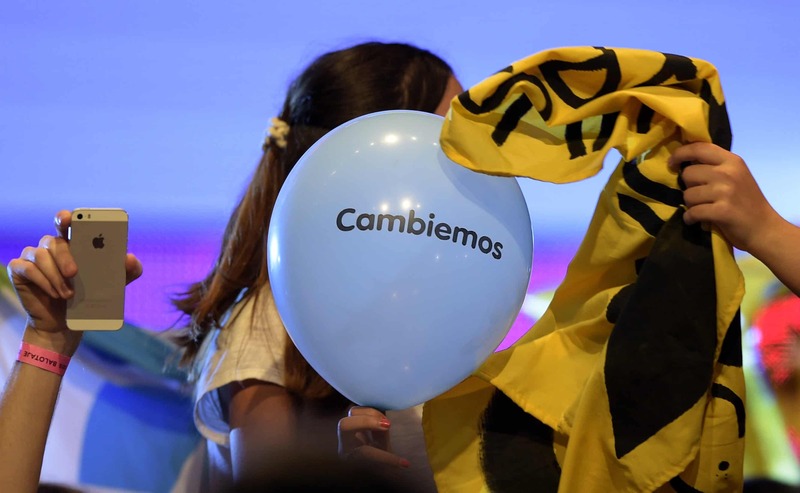 “We have enormous expectations and 100 percent confidence,” said 27-year-old Sofia Matricali, a supporter at the rally of Macri’s Let’s Change coalition. Leaders in Scioli’s camp had yet to react publicly, but the mood was downbeat at the city center hotel where his supporters were gathered. Macri climbed in the polls after losing closely in the first round vote on October 25 to Scioli, an ally of the combative outgoing president Cristina Fernández de Kirchner. That result forced Argentina’s first ever presidential runoff. Macri has capitalized on discontent among voters who said they were fed up after 12 years of rule by Kirchner and her predecessor and late husband, Néstor Kirchner. With social welfare programs and protectionist economic policies, they won affection among poorer Argentines and mistrust among foreign investors. Macri has vowed to free up trade, liberalize the economy and negotiate with Argentina’s foreign debtors. His apparent victory would break the grip of Peronism, the broad populist movement that has dominated Argentine politics for much of the past 70 years. Scioli, an ally of Kirchner but closer to the political center, said that Macri’s proposals threatened Argentines’ welfare payments, salaries and industry. Yet he too has admitted the need for certain financial reforms. He called on voters to “choose the best path for social, economic and political stability,” after casting his ballot. The increasingly tense campaign was fought on shifting political ground in the vast South American nation of 42 million people. Macri proposed to immediately lift restrictions on imports and on U.S. dollars. Analysts say he might struggle to push reforms through a hostile Congress. His rise lifted hopes among financiers, but fears among domestic businesses and poorer Argentines who have benefited from the social and trade policies of the combative outgoing president. Cristina Kirchner had sharp words at times for foreign powers including the United States, and for Britain in the territorial dispute over the Falkland Islands, known in Spanish as Las Malvinas. After a 2001 financial crisis in which Argentina was bailed out by the International Monetary Fund, the Kirchners presided over a spectacular turnaround, but the economy now seems to be flagging again. Growth was relatively slow at 2.2 percent in the first half of this year and inflation exceeds 20 percent.